Johnny Schmitz passed away last Saturday in Wausau, Wisconsin. Schmitz pitched two years for Brooklyn. Wausau native Johnny Schmitz, a former All-Star pitcher who faced Hall of Fame baseball legends such as Ted Williams, has died in Wausau at age 90. Schmitz, who debuted with the Chicago Cubs, spent eight seasons in Chicago before shuffling around the major leagues. He went on to play for the Brooklyn Dodgers, Cincinnati Reds, New York Yankees, Washington Senators, Boston Red Sox and Baltimore Orioles. Known also as "Bear Tracks," because he had large feet and seemed to shuffle to the mound, Schmitz tallied 93 wins and 114 losses in 235 starts. He finished his career with a 3.55 earned run average, according to the Baseball Almanac. Schmitz, who died Saturday, also pitched 86 complete games. 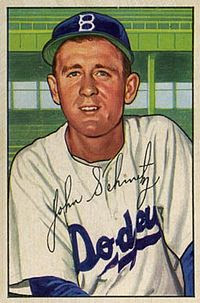 During his All-Star 1948 season, Schmitz had an 18-13 record with a 2.64 ERA and 18 complete games, according to the Baseball Almanac. Click here for his Baseball Reference profile. ...bowing my head in a reflective prayer for another Beloved Bum.